Our membership along with our leadership team is committed to making the remaining year a strong statement for our chapter and the Minnesota Omega Men can and will be proud of. Epsilon Rho continues to grow stronger day by day, extending the hand of friendship as we reach out to every brother in the Twin Cities. 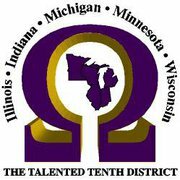 We are proud to be a vibrant chapter of the Talented Tenth District and Omega Psi Phi Fraternity, Inc. We invite all brothers of Omega Psi Phi Fraternity, Inc. to join us at our monthly chapter meetings (every 2nd Friday) as we continue to build on the foundation of our cardinal principles of Manhood, Scholarship, Perseverance and Uplift.